NEW! Now selling Race Driven Can-Am Rear Brakes! Starting at $14.95! 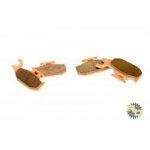 We are now selling brand new Race-Driven Severe Duty Sintered Metal rear brake pads! Come check them out!